Phishing refers to the fraudulent activity of sending an e-mail under false pretenses with the goal of obtaining bank account or credit card information from an unsuspecting consumer. The e-mails often falsely claim to be a financial institution, like your personal bank, but are really identity thieves in disguise. They ask for personally identifiable information that they would then use for nefarious purposes. The e-mails usually contain a link to a website. If the consumer clicks on the link in the e-mail, it takes them to a screen and asks for log-in information in the form of account numbers and passwords. Do not even open these e-mails and by all means do not provide account number information. 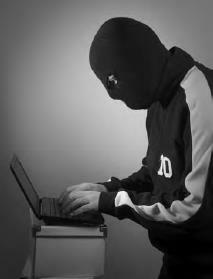 Computer hackers are people who try to gain access to personal or corporate information electronically for fraudulent purposes (iStock).